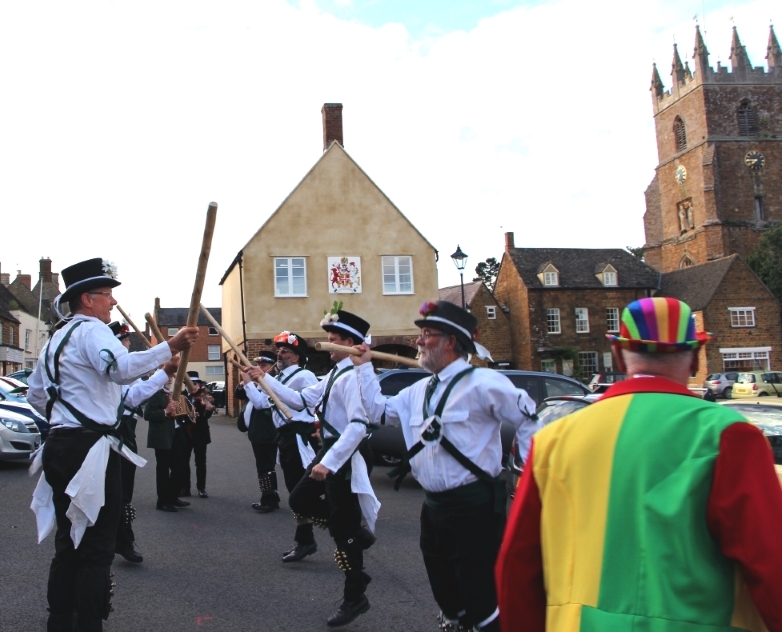 We were asked to provide a small Morris presence to add extra colour to a Tudor Minstrel performance in the village of Wilmcote so we sent two men and a horse. The event on Saturday 24 September was well attended and generated a good deal of interest in the Morris and several discussions about the AVMM tradition and the origins of the Morris. A gentleman from Madrid knew a lot about the Berber people and genetic links between these people and some Scots. Initially our men were invited on stage to join in choruses on a selection of local and Elizabethan songs. Later we demonstrated 12 examples of our repertoire of dances also involving Charlie the ‘Oss, who proved very popular with the large number of children present. We sang two Adderbury songs, Landlord and Happy Man and even attracted a potential recruit who mastered the basics of Sweet Jenny Jones and Brighton Camp – a very promising find from Bloxham. Squire David Reed writes: This afternoon we revived our traditional end of season pub stop at the Black Boy Inn, a celebration of Chris Garrett’s birthday due on Wednesday. Unfortunately, although in attendance, he had a note from home saying he was to be excused PE today. The same applied to Bob Southern who ventured over from Worcester to watch us. We wish our two medical cases a speedy recovery. 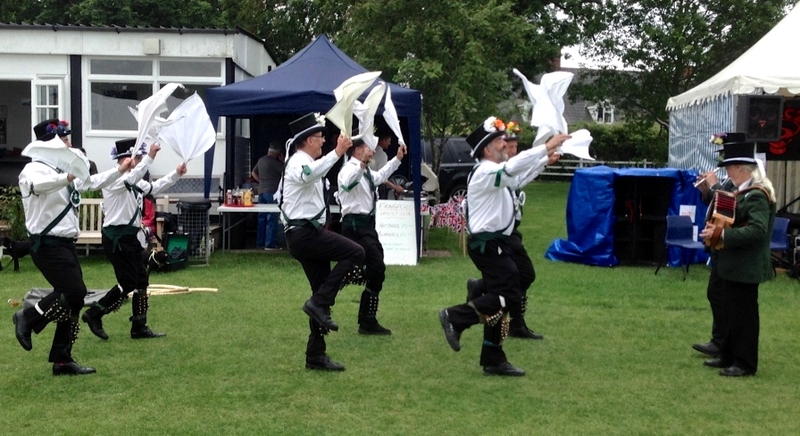 The weather was somewhat damp but our 8 fit dancers and 3 musicians squeezed in 9 dances between the showers. The pub provided us with bowls of delicious thrice cooked chips and we enjoyed a natter in the bar when the rain got the upper hand. Thanks chaps for turning out on a damp day – it was great to see you all. 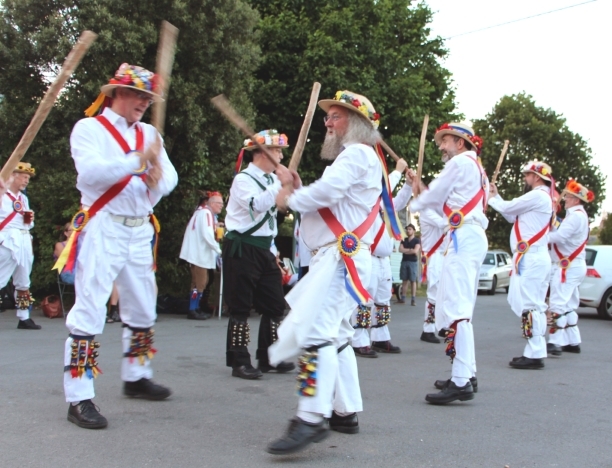 At the invitation of the Gloucestershire Morris Men, AVMM danced with GMM and Eynsham Morris at The King’s Head Inn, Bledington, on Tuesday 19 July. Squire David Reed writes: Setting off at 6:45pm on the hottest day of the year, the car temperature gauge was still showing 30C though fortunately, the King’s Head dance area was in shadow. We got the evening under way with Sweet Jenny Jones assisted by melodeon from Mike Thomas of GMM followed by Beaux, Flasher, Buffoon, Washing Day and Brighton Camp (5 of us + 5 young Snell and Teare family members & friends). For our last two dances, we borrowed experienced members of GMM – Lads a’Bunchum (with Paul Gilman) and Black Joke (with Bob Entwistle). Paul can often be seen in the crowd on our Day of Dance each year. After darkness fell, GMM led us in a music and song session in the open air with additional contributions from Eynsham and AVMM. Bagman John Ekers adds: The setting was perfect on a balmy evening with a full moon. Our Squire did a spot of moonlighting himself, donning his straw hat for our hosts (Squire Dave can be spotted in the photo below) and he also led the music and song ensemble in a couple of unaccompanied songs. Thanks to all who have been able to support the side thus far – it has been a lot of fun. See you all again in September at Chris Garrett’s birthday bash on Saturday 3rd September in Milton . 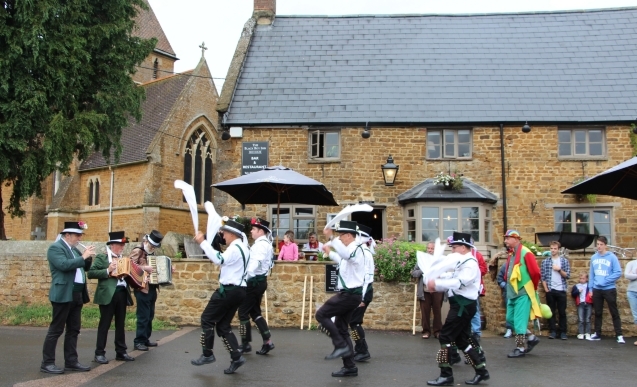 We ventured out on Wednesday 6 July and danced at two Bloxham pubs. Donald and Dave provided the music for the six dancers. Dave has now swapped his fiddle for a viola – classy Morris! First stop at 7:30pm was The Joiners Arms where we did just four dances due to a lack of audience. Bagman John Ekers writes: The Joiners was as lively as I anticipated. A couple of Polish chefs watched from their kitchen and some bloke saw us start dancing and quickly rang for a taxi. Said chef even filmed us on his phone, and in fairness to the passenger patiently waiting for his taxi we shouldn’t have assumed he was there to see us! Squire David Reed writes: The short walk across the Old Bridge Road brought us to The Elephant & Castle for 8pm where we put on a lengthy show of ten dances for those in the beer garden. Not a huge audience but we were competing with Wales v Portugal on TV from Stade des Lumières. The non-football fans gave some welcome applause, and as well as the beer there was a good selection of ciders, including Dorset Dabinnett and Rosie’s Pig. As usual we concluded with Brighton Camp including audience participation – a Forester (from Cinderford) and an Australian (from Newcastle, New South Wales). Our next pub evening is The King’s Head (The Green, Bledington, Chipping Norton OX7 6XQ) on Tuesday 19 July at 7.45pm. We are guests of Gloucestershire Morris Men, who have also invited another Oxfordshire side – Eynsham. Should be an interesting variety of dances, including of course those from Bledington itself. AVMM recently began a mini-tour of local pub venues. Squire David Reed writes: At 7.30pm on Wednesday 22 June, we met outside The Unicorn Inn, Market Place, Deddington. 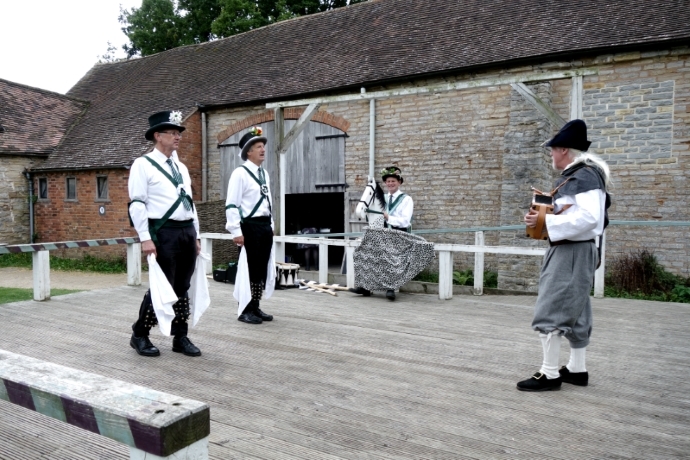 We had a splendid turnout of musicians (accordion, two fiddles, melodeon and whistle) to accompany our Fool and six dancers who performed 14 dances. Our arrival caused some excitement among the pub clientele so we started with an attentive audience through until our much needed mid-session beer break. We resumed with our usual enthusiasm but when the crowd had dwindled to two by 9pm, we decided to wind up the evening. It was a great pleasure to see Mrs Plester who came out with Jim to watch us, especially as she couldn’t make it to this year’s Day of Dance in April. Well done to press-ganged Morris man Giles Snell for wielding my camera and surviving Brighton Camp. We hope to see you at our next pub dance out in Bloxham on 6 July. On Saturday 11 June, AVMM performed at the 2016 Candleford Beer Festival in Fringford. 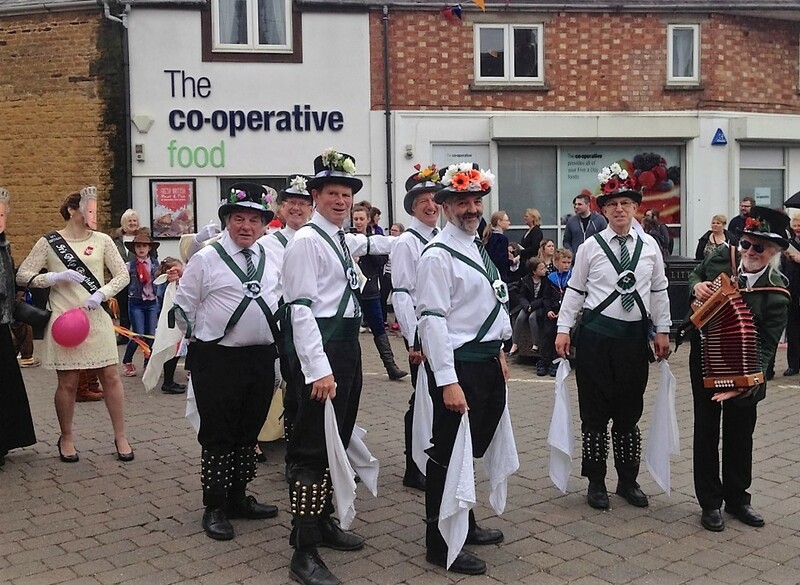 Bagman John Ekers writes: Many thanks to the seven dancers who gave such a fine performance at Fringford yesterday and to our muscians Donald and Malcolm for keeping us in step as we performed 14 dances in our two sets. The whole event was a great success and I am very grateful to those who turned out as well as to members of the side who couldn’t come along, but sent messages of support. 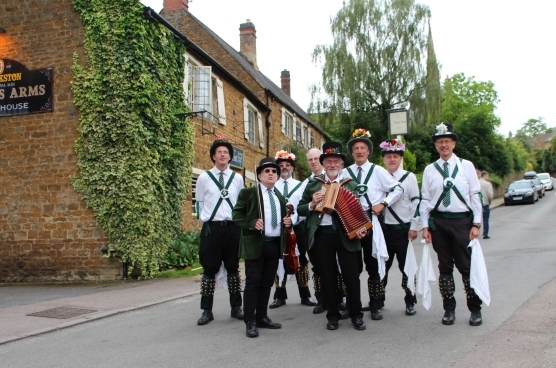 AVMM’s next outing is on Wednesday 22 June when we will dance outside the Unicorn in Deddington starting at 7.30pm. Squire David Reed writes: On Saturday 21 May, seven brave souls met up at 12:15 in dubious weather at Moulton. We arrived just before the morning session ended, so Simon Care invited us to finish off the performance at the Telegraph Inn. We gave them Sweet Jenny Jones before heading for lunch at the Primary School. Other sides in attendance were Saddleworth, King Johns, Thaxted and Monkseaton. The afternoon started with a carnival procession around the village, during which we improvised a progressing Princess Royal. The ladies following us in Queen face masks were unnerving (see the photo below!). The Bishop of Brixworth recognised our baldricks and made himself known to us at the end of the procession. He is none other than John Holbrook, vicar of Adderbury 1993-2001, and he came to watch us dance at the Telegraph Inn. Subsequent spots at Church Hill and Cardigan Arms did not attract much attention, so we retired to The Artichoke for a pint. We then joined the massed display in the Public Gardens, our contribution being a surprisingly energetic Constant Billy. The day finished with tea and cakes, appropriate for Richard who for the second year was celebrating his birthday with Morris dancing. Thanks to David Snell for the photo. Squire David Reed writes: Thanks to the men who turned out on Saturday 14 May to appreciative audiences at three venues. We started the day at Kineton Farmer’s Market and our last dance, Brighton Camp was enlivened by the participation of the local copper. We think that this is the first time we’ve danced with the Police. Next we danced at the Butcher’s Arms – our grateful thanks go to landlady Fenella for providing sandwiches to keep us going. 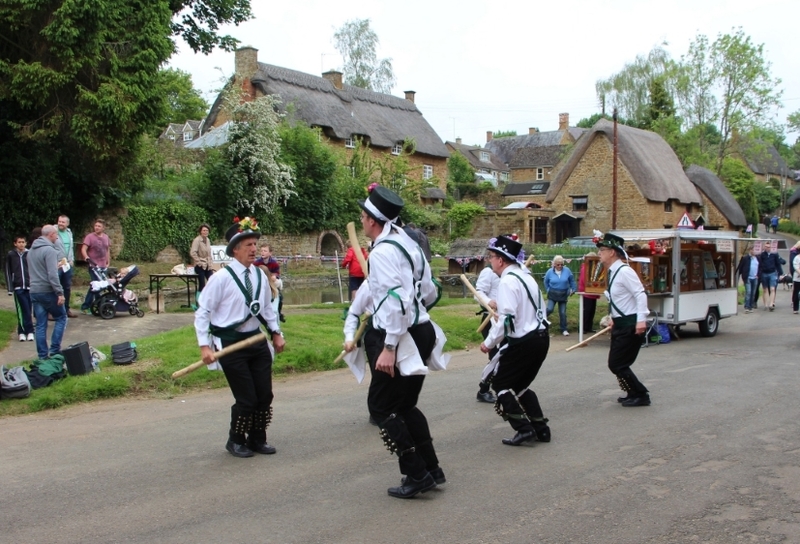 As we were down to four dancers at this point, we adapted our dances for the rest of the day but we were able to put on a long show at the Shutford Queen’s Birthday celebrations. Police participation again for Brighton Camp via the involvement of their PCSO. 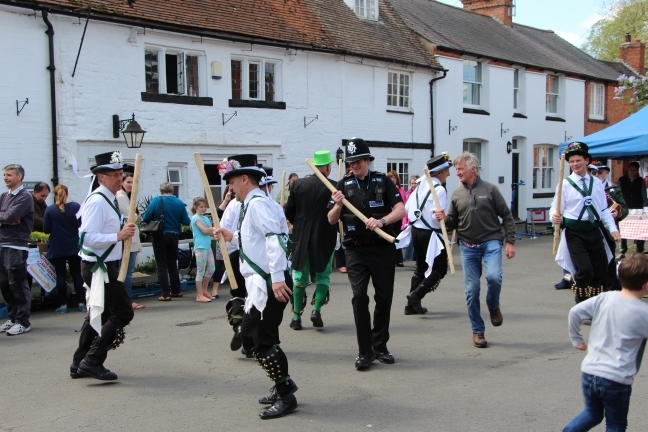 We danced 28 times in the day (18 different dances) and with two different police officers – a great day out! 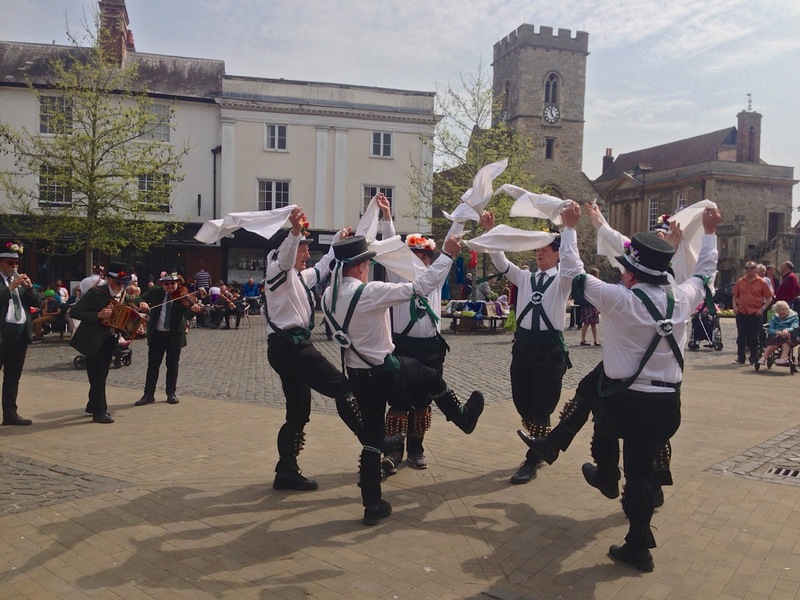 Squire David Reed writes: ‘A great day with Mr Hemmings Morris and four other guest sides in Abingdon. We fielded three musicians and seven dancers and performed 14 dances including one massed Nutting Girl. We also taught members of Mr Hemmings and Borderline how to do the AVMM version of Beaux of London City’.